Shaq Fu 2 Could Be a Thing! Some of you may remember, others may not, but back in 1994 Shaq Fu was released for the Sega Genesis and Super Nintendo. 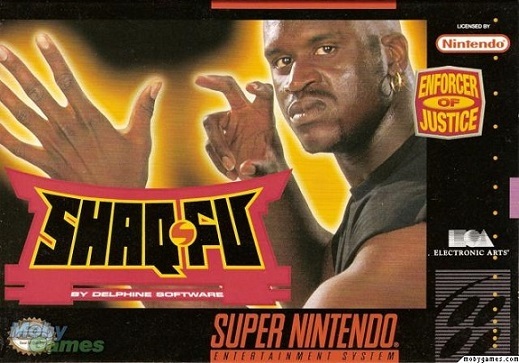 Shaq Fu was a 2D fighting game that pinned the famous NBA superstar Shaquille O'Neal against enemies of another dimension. How did Shaq find himself in this other dimension you ask? Well Shaq randomly wanders into a Kung Fu dojo and runs into a Kung Fu maser, who tells him he must enter this second world to save a young boy named Nezu from the evil mummy Sett-Ra. As you can assume, this game was HORRIBLE. So bad infact, that there is even a website dedicated to telling people to destroy every copy they run across. Now why am I talking about this terrible game from the 90's? Well at CES 2014, Gamerfitnation interviewed Shaq and jokingly asked if we would ever a sequel to Shaq Fu, which Shaq replied with "Actually, yes. It's coming soon. And the graphics are crazy. I promise you, wait until you see it.". Skip to 1:48 to see it yourself in the video below. Now it's not very clear if Shaq was joking or not, but way back in May trademarks were filed by Mine O'Mine, the company that runs shaq.com. So what do you guys think? Is this just a coincidence or will we really see a next-gen Shaq Fu game? Leave your thoughts below!